Delcatty-ex (EX – Crystal Guardians 91/100) our nostalgic follow-up to last week’s Delcatty (EX – Ruby & Sapphire 5/109; EX – Power Keepers 8/108), and we’re going to pretty quickly see why the two worked well together, though perhaps not well enough. 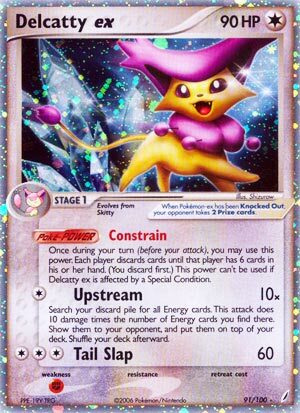 Delcatty-ex is a Pokémon-ex, which are basically the ancestors of Pokémon-GX, giving up an extra Prize when KO’d and dealing with anti-Pokémon-ex effects while also being excluded from certain beneficial effects. Unlike Pokémon-GX, Pokémon-ex had no GX-attack but it wasn’t unheard of for them to have one non-attack effect with two attacks. They usually had more HP than their baseline counterparts, however in this case, it was just +10 over the largest contemporary Delcatty… and 90 HP wasn’t much back in the day, either. Delcatty was Colorless, which actually hit certain forms of Weakness and Resistance back in the day. Being a Stage 1 isn’t bad now and it was pretty solid back in the day; Rare Candy had a much more potent effect, allowing a player to immediately Evolve a Basic into either its Stage 1 or (if it had one) directly into its Stage 2. [F] Weakness was still a problem, lack of Resistance was still technically bad but didn’t usually matter, and a free Retreat Cost was still great. Delcatty-ex has a Poké-Power, a predecessor to the Ability mechanic, and two attacks. “Constrain” could be used once during your turn, before you attacked, though if you had more than one instance of it in play, each could be used once. It wasn’t something you were too likely to get a lot of mileage out of, as Constrain forces both players to discard down to a hand of… six cards. No, hands were insanely huge back in the day; this wasn’t an effect I recall being super useful, and where it came in handy was usually a deck that wanted something in the discard pile and had a different trick to get large amounts to your hand. Its first attack is “Upstream”, which costs only [C] and does 10 damage times the amount of Energy cards you have in your discard pile, then shuffles all those Energy cards back into your deck. Yes, the actual wording makes it sound more complicated than that. It is important to note that this effect worked on Special Energy cards, which have almost always been tricky to recycle; let me remind you that the last few years have been abnormal, with Special Charge and (before it was banned) Puzzle of Time. Typical HP scores were much lower than at present, so 10 per Energy was pretty good, but the mass Energy recycling was the real draw. “Tail Slap” doing 60 for [CCC] would be garbage now, but again, HP scores were much lower AND you had Boost Energy plus a means of recycling Boost Energy. Delcatty-ex actually rose to fame as part of a deck called “Inferncatty” by most, utilizing the “Energy Draw” regular Delcatty, Infernape (Diamond & Pearl 5/130), and Infernape LV.X (Diamond & Pearl 121/130; DP – Black Star Promos DP10). While this in no way sped up Energy attachments to Infernape, all the Energy discards would help build up to either a super strong Upstream or the “Flare Up” attack on Infernape LV.X. For those unfamiliar with the Level-Up mechanic, LV.X Pokémon are similar to BREAK Evolutions, but they actually are considered to have the same name as the underlying Evolution and don’t count as Evolving BUT you could only “Level-Up” your Active Pokémon. Inferncatty’s rise to success wasn’t just halted but reversed into a crash as multiple strong decks naturally countered it, either via Type matching, countering Poké-Powers, or both. I actually remember Delcatty-ex from a different deck, which I named “Delgatron” because it sounded like a Transformer’s name and because it ALMOST made sense based on the Pokémon included: Delcatty + Feraligatr + Magneton. More specifically, the deck used the above Delcatty and Delcatty-ex combo, Feraligatr (DP – Mysterious Treasures 8/123), and Magneton (EX – Dragon 17/97; EX – Power Keepers 16/108). Though I would initially use as many Rare Candy as I could spare to rush Delcatty (not Delcatty-ex) and the first Feraligtr to the field, as Double Rainbow Energy meant Feraligatr could go from no Energy to using its “Energy Cyclone” attack immediately. Energy Cyclone worked by discarding Energy cards from your hand, however, which is where Magneton and (eventually) Delcatty-ex came in; this Magneton has the Poké-Power “Magnetic Field”, allowing you to discard a card from hand (once per turn, before you attacked) in order to add two basic Energy cards from your discard pile to your hand. You may wonder about burning through Rare Candy so quickly, but you actually wanted as many Croconaw to hit the field as you could. Specifically, Croconaw (DP – Mysterious Treasures 44/123) has the Poké-Power “Evolutionary Vitality”, which triggered when you Evolved a Totodile into it from your hand. Evolutionary Vitality let you look at the top five cards of your deck, add any Energy cards you found there to your hand (after showing them to your opponent), and finally shuffling the non-Energy cards back into your deck. While Magnetic Field only worked with basic Energy cards, this worked with any Energy cards, much like Delcatty-ex’s Upstream attack… which you’d use to replenish your Energy supply if it started to run low. I’m not sure how competitive the deck actually was but I do remember enjoying it quite a bit. Enough to reminisce about Delcatty-ex, especially when I couldn’t find an old review for it. Due to how game mechanics have changed, Delcatty-ex couldn’t be reprinted as is, but for the sake of discussion, if a hypothetical “update” of it that was either just a regular Delcatty or a Delcatty-GX were printed, it could be pretty great. If could also be terrible; unfortunately they don’t always update all aspects of a card, so if it were – for example – a 90 HP Pokémon-GX with Upstream as a GX-attack while everything else about the card remains the same, that’d be pretty terrible indeed. I’m not sure even a “good” update would matter to Expanded something unusual (but not unprecedented) and seriously improved Constrain or just replaced it with Energy Draw. For Standard, a way to recycle Special Energy could prove very important indeed. Getting back to the AS IS, Delcatty-ex was a nice pull for Limited and if you somehow are busting open EX – Crystal Guardian packs for a Limited Event nowadays, it still should be. Just try to save it back for a finishing blow with Upstream, though you could probably use a Tail Slap or two first without too much risk.